Giant Tiger and staff were the Chatham Goodfellows 2018 President Award recipient. They were recognized for their long-term support for Chatham Goodfellows. In 2017 Giant Tiger’s manager, Mark Lush and his staff made a monumental commitment to Chatham Goodfellows to support the Chatham Goodfellows “Boot Program” which had been dormant since 2013. Last year the soft re-introduction of the “boot program” was a success. In 2016 the staff collected a total of $3,000.00 for Chatham Goodfellows “No Child With a Christmas” campaign. Last year the staff collected almost $10,000. 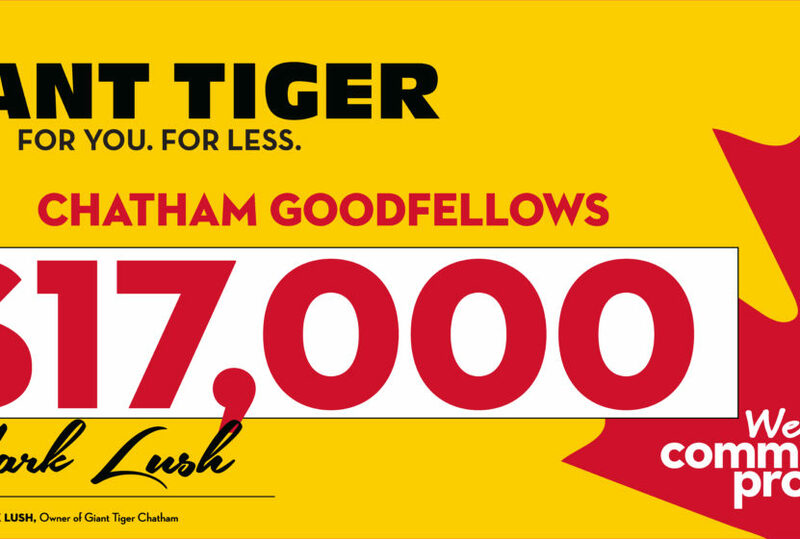 This year Giant Tiger staff and manager Mark Lush are overjoyed to announce that $17,000.00 was raised for Chatham Goodfellows. Chatham Goodfellows is gratefully to have wonderful partnerships in order to help us achieve our simple motto of ” No Child Without a Christmas”. While our Code is much longer, the key statements in the Code says it all; Goodfellows follow a simple code; It’s helping the chap who’s bearing a load. It’s bringing a smile to a youngster’s face. Restoring his trust in the human race. It’s sharing the warmth of year-end joys. With thousands of worthy girls and boys. It’s helping the young and old to know. That someone cares when ill winds blow. To Giant Tiger staff and Mark, Chatham Goodfellows thank you. No Child in Chatham-Kent will be without a Christmas this year. » In The News » Thank-you, Giant Tiger!